Steve vs. Joe! 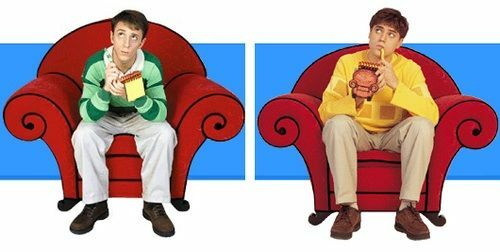 : Who's Better on Blue's Clues? In 2002, I spent a month in Arlington, Virginia, working on the world premiere production of my play, Boyz of All Nationz: The Rise and Fall of a Multi-Ethnic Boy Band. 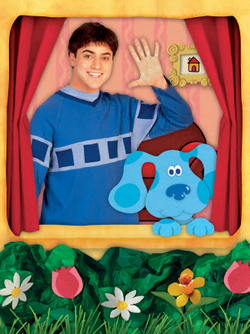 Each morning I would exercise while watching Blue's Clues, a hugely popular Nickelodeon show for preschoolers. The program was oddly mesmerizing for adults like me—not only because of its strangely soothing premise and structure (just perfect and gentle so early in the morning), but also because I had a huge man-crush on the host, Joe. 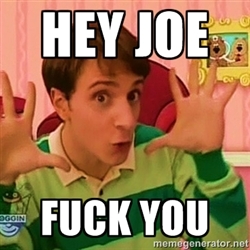 It was Joe's first enthusiastic year on the show—he replaced Steve Burns, who had been hosting since 1996. Steve, the host, presents the audience with a puzzle involving Blue, the animated dog.... In between the discovery of the clues, Steve plays a series of games—mini-puzzles—with the audience that are thematically related to the overall puzzle.... As the show unfolds, Steve and Blue move from one animated set to another, jumping through magical doorways, leading viewers on a journey of discovery. One of the more fascinating facts about the show was that the same episode was aired five days in a row. And kids would watch it every day. Their comprehension increased, of course, upon repeated viewings. But to those who became familiar with the program during the Joe years, they can't imagine anyone else hosting. Man, you would not believe the long, involved discussions I've gotten into with friends, defending Joe's efficacy (and, well, hotness). I already know that this poll will skew towards Steve, so may I use this opportunity to point out once again the glory of Joe (who is really Shakespearean-trained actor Donovan Patton)? BAMBOO NATION: Steve vs. Joe! : Who's Better on Blue's Clues?